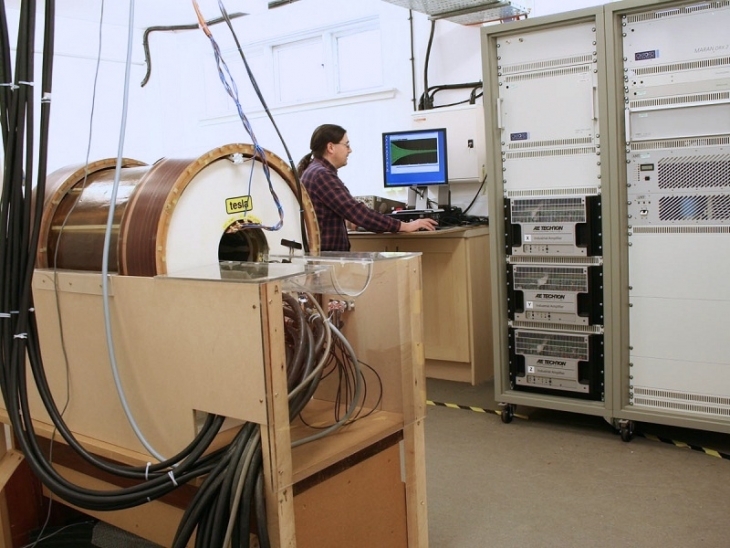 We have developed novel equipment to carry out our research on fast field-cycled MRI (FFC-MRI). 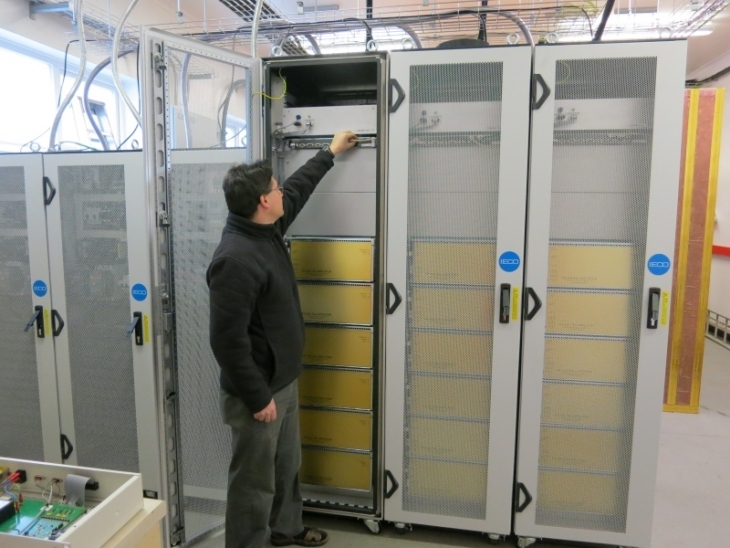 Many of these MR systems are unique in the world, and offer unprecedented facilities for research, and for their use in applications. The techniques themselves are described elsewhere on this site. 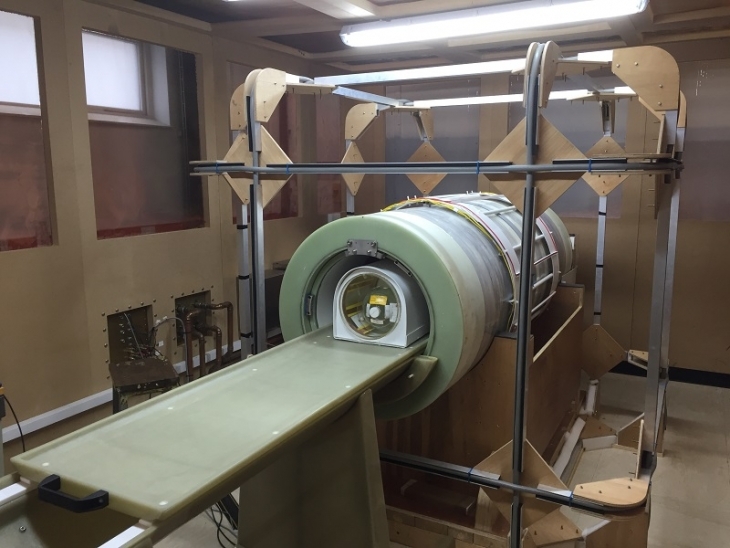 In our first-generation whole-body field-cycled MRI system, the detection magnetic field is provided by a permanent magnet which generates a vertical field of 59 mT. 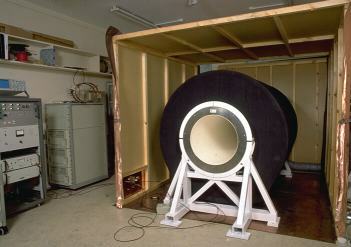 Just inside the bore of the permanent magnet is a resistive magnet, made from copper conductor in a saddle configuration. 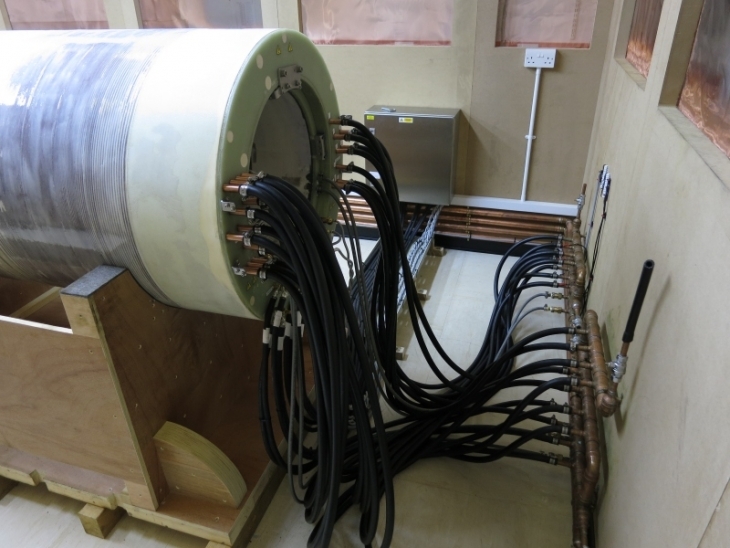 When electric current is sent through the resistive magnet windings they generate a field of up to 59 mT, in opposition to the permanent magnet's field. In this way, switching on and off the current switches the total field in the centre of the magnet down and up in value, and the precise field value can be selected by choosing the correct current to send through the resistive magnet coils. 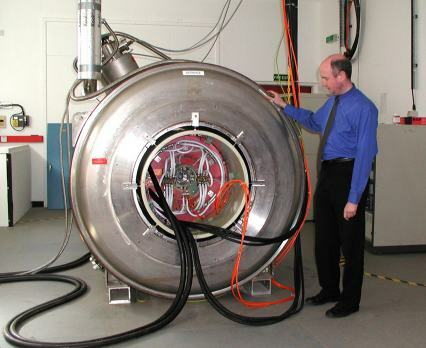 Our second-generation imager used the same technique, but here the primary magnetic field was provided by a 0.45 tesla superconducting magnet. A resistive secondary magnet coil was again used to oppose the field from the primary magnet, but in this case it was also necessary to have a third magnet coil called an "active shield" coil between the primary and secondary, in order to avoid eddy currents while switching the field. In both systems the typical switching time between magnetic field levels is 30-40 ms, which is significantly shorter than the T1 relaxation times in most biological samples or in the human body. 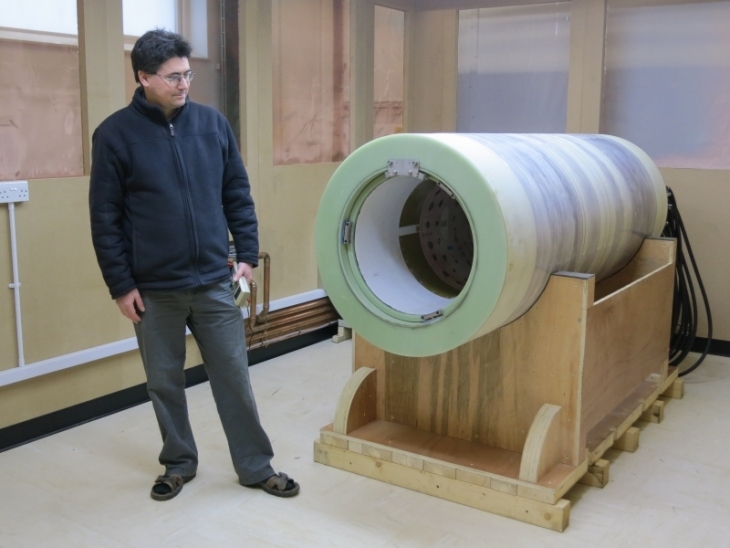 More recently, we have built two FFC-MRI scanners based on a single-magnet design. The use of a single resistive magnet makes the pulse sequence more flexible, as the detection field can be altered as well as the polarisation and evolution magnetic fields. However, this flexibility comes at the expense of potential instability of the magnetic field during the detection period. Therefore, particular attention must be paid to the design and implementation of the control circuitry and the magnet power supplies. 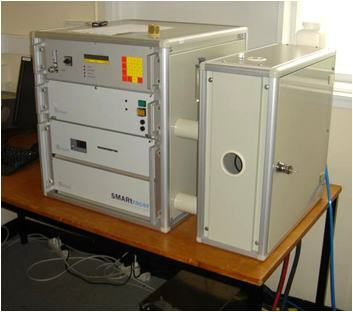 In addition to the home-built scanners described above, we have a commercial bench-top field-cycling relaxometer (Stelar SMARtracer), capable of making T1 dispersion measurements from 10 kHz to 10 MHz proton Larmor frequency on small (~1 ml) samples.